Lovers in a Dangerous Spacetime, which was only just made known through last week’s Japanese Nintendo Direct, already has a release date. Developer Asteroid Base announced today that the launch will be taking place on October 3. Lovers in a Dangerous Spacetime will cost $14.99. 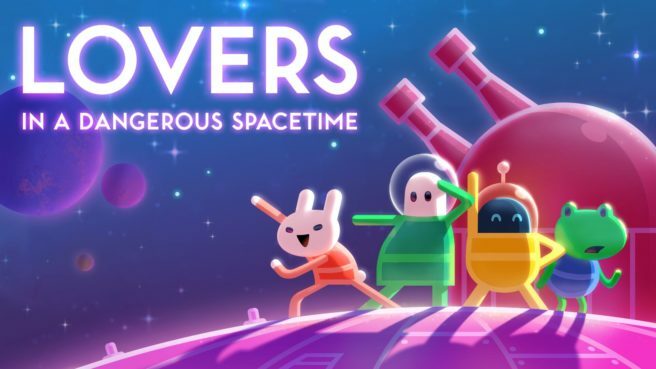 In Lovers in a Dangerous Spacetime, you can expect frenzied co-op action as you switch back and forth between manning a spacecraft’s controls, weapons, and defenses against alien robots. If you’d prefer playing the campaign alone, you can do so with a trusty AI space dog or cat. We have plenty of additional information about Lovers in a Dangerous Spacetime below, along with a new Switch trailer. Lovers in a Dangerous Spacetime is a frantic co-op action game where players guide a whimsical neon spaceship through a treacherous world by frequently switching back-and-forth between manning turrets, lasers, shields and thrusters. While exploring a colorful galaxy, astronauts must use teamwork to triumph over evil robots and other hazardous creatures to rescue kidnapped space bunnies from a vacuumy demise. Deep space is a dangerous place, but at least no one has to face it alone! • Unity During Chaos – Players (or one player plus a loyal AI space-dog) must work together to man the crazy spaceship controls, dashing back and forth between weapons, shields and engine stations. Both players have important roles at all times, and nobody gets left behind. • Simple Controls, Deep Play – Controlling a little astronaut is simple enough for anyone to pick up –just a stick and two buttons to use. But getting both players to work together like a well-oiled machine while battling a galaxy of evil robots…that’s tricky. • A New Battle Every Time – Procedurally generated star systems mean that each time rocketeers replay a level, whether it’s because they’re backtracking to collect more bunnies (needed for unlocking later areas) or if it’s just replaying a campaign for fun or on a harder difficulty, it will always be a new layout. Lovers is about working together to adapt to new situations rather than memorizing level layouts.There’s also no permadeath, so players only lose their progress in that level when they die. • Customizable Ships – Find powerful gems, including Metal Gem, Power Gem and Beam Gem,to create the ultimate warship. Whether it’s throwing a Metal Gem onto a ship’s shield to morph it into spikey steel armor, or putting it on an engine to leave a trail of dangerous space-caltrops, space travelers can develop their spacecraft for space’s toughest obstacles. A variety of power-ups means allows for 36 upgrade combinations and now players can combine gems for even mightier power-ups.